No, I’m not Lex Luthor trying to lure Superman into a trap this October in Minden, Louisiana. I’ve got more hair … than Lex Luthor, that is, not Louisiana. But not by much. Nor is it Spider-Man, Aquaman or Captain America I’m after. My plot is more sinister – I’m going to take on Green Girl. Yep, it’ll be Green Girl meets the Red Neck. Seriously, my neck is like totally red after spending a few days at the beach. I know I’m taking a chance here, since I don’t know exactly what Green Girl’s powers are. I know she’s got something to do with being a good steward of the environment or some kind of do-gooder thing like that. And my only power is the ability to play Jerry Reed’s “East Bound and Down” with my armpit, though it’s a highly underrated anti-superhero weapon. Trust me, it’s terrified many a girl over the years, and I suspect Green Girl would be no exception. I don’t know for certain that Green Girl will show in Louisiana, even though the Fuller Center for Housing is very environmentally-conscious and practices green building whenever possible, so there’s a chance. Besides, I’ve gotten confirmation today that Fuller Center ambassador and HGTV star Kimberly Lacy will be there. 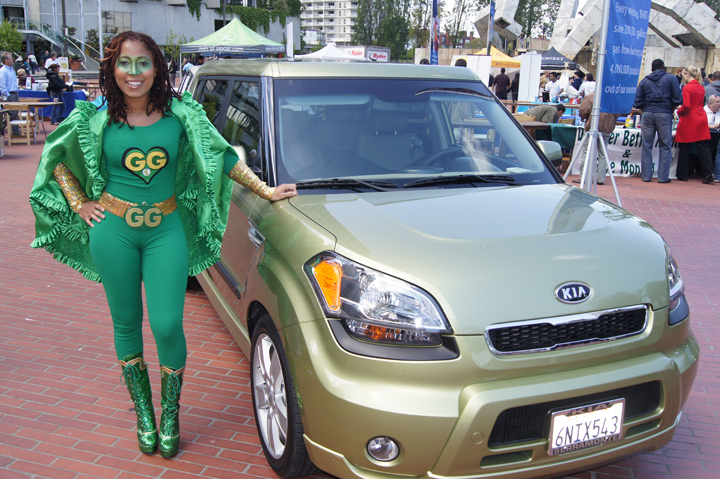 Now, I’m not saying that Kimberly and Green Girl are the same person, but this recent picture snapped of Green Girl in action at some “green” event in California sure makes me ponder the possibility. Of course, with all the work Kimberly has already done for the Fuller Center and the upcoming work in Haiti AND Minden, it’s hard to believe that Green Girl could be any more of a superhero than Kimberly herself. Click here to join the fun at the Legacy Build this October or to learn more. Read about Kimberly Lacy’s Haiti trip here.